Nuestro Camino was made the old fashioned way. A few players, well acquainted with and sympathetic to each other, got together in a good-sounding room to run through a set of songs, and a talented producer/engineer got the results down, in real time, on tape. Certain details were, of course, changed. The session did not take place in Rudy Van Gelder’s New Jersey living room; instead, Jim Eno captured the sounds at his Public Hi-Fi Studio in Austin, Texas. The modern day Ben Dixon is drummer Kyle Thompson. In lieu of Baby Face Willette or John Patton, we hear Mike Flanigin, a Hammond organ maestro who regularly plays blues with Jimmie Vaughan at the Continental Club, and lays down serious funk behind Mike Barfield. Rather than Grant Green, Jake Langley–whose versatility has been shown through his work with artists as diverse as Pinetop Perkins and Cindy Cashdollar, and in his five years touring with Joey DeFrancesco–is on guitar. Their band is called Dupree, and the music they make, refreshingly free of environmental contaminants and artificial additives formulated by modern science, is organ trio jazz in the best tradition: heavy on soul and standards; lowdown, yet often elegant; and clearly intended to move the body and spirit at least as much as the mind. Nuestro Camino is, quite simply, superb. Six songs make up the core of the album (more about that later). Greasy and propulsive, Flanigin’s “The Turtle” recreates the blue beat sound of vintage soul jazz. Thompson’s impossibly syncopated groove underpins the proceedings; Langley blends funky chording and Green-inspired single notes; and Flanigin builds tension mercilessly in his solo. The smoky blues “Malibu Classic” runs cooler, the B3 adding stabs and swells in the background as the guitar outlines the head and takes the first few lead choruses, mixing octaves, burbling note combinations, and fluid lines. Flanigin’s organ solo is full of hip rhythmic displacements and winding phrases. Cooler yet is the moody, minor lope “All Or Nothing At All.” Thompson drops bombs throughout, giving the standard a rolling feel that sets the table for Langley’s fleet lines and some beautiful work from Flanigin, who dials in a series of fantastic tones as he plays around the melody. In the invigorating “KC,” Flanigin holds a pedal note beneath increasingly insistent lead lines to great effect; his overdriven tone is sure to induce ecstacy in B3 fanciers. Thompson’s part is hard R&B, just a funky, displaced beat away from Motown’s signature four-to-the-bar snare hits. The swinging “Leon’s Thing” motors along nicely, Flanigin’s trebly, hollow tone balancing Langley’s rounder sound. A vaguely flamenco-flavored guitar introduction eases the trio into the exotic “Moto Guzzi,” a sultry piece that evokes palm trees and tropical breezes, splitting the difference between Latin and tiki sounds. Four bonus tracks round out the set. Langley submits “Nightcap,” a mellow, swaying meditation. Tina Brooks’s “David The King” and Horace Silver’s “Cookin’ At The Continental” shift the focus slightly, letting Dupree work out in hard bop settings. They excel here, too, playing with imagination and intensity while maintaining a solidly bluesy feel. The album’s surprise pick hit, taking a page from later developments in soul jazz, when pop tunes provided new launch pads, is the Bacharach-David composition “Close To You,” originally made famous by The Carpenters, here taken to church with beautiful tones and a subtle approach. I began this piece by pointing out the project’s throwback vibe. Probably nothing illustrates that more clearly than the fact that the CD edition was actually an afterthought. 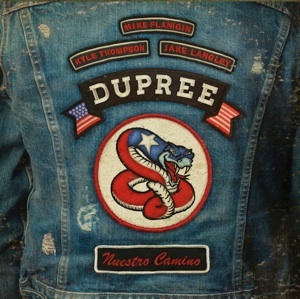 The bonus tracks, included on the CD, are available as downloads to those who purchase the LP or 8-track versions of Dupree’s album. Yes, you read that correctly: the recording is available on 8-track tape. In any format the listener chooses, Nuestro Camino is wildly successful at extending the organ trio tradition. The album feels great and sounds incredible; its music is perfect for driving, for dim-light chilling, or for intensive listening. Dupree has it going on in every department: creativity, chops, groove, dynamics, tone, and songs. Highest recommendation. I purchased this CD from Public Hi-Fi’s Web site.